Just because you're following a vegetarian diet or inviting vegetarian guests to your party doesn't mean the foods you serve have to be boring and bland. Using vegetarian party food recipes will help you wow both vegetarian and non-vegetarian guests alike. 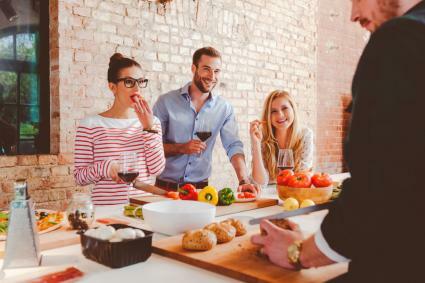 Adding finger foods to your vegetarian menu plan is sure to be a hit with party guests who like to chat and eat while standing up. Summer recipes, such as salted fruit bites and summer stuffed mushrooms, work well for vegetarian party menus any time of the year. This fun party recipe idea goes great with any party theme, especially during summer feasts. 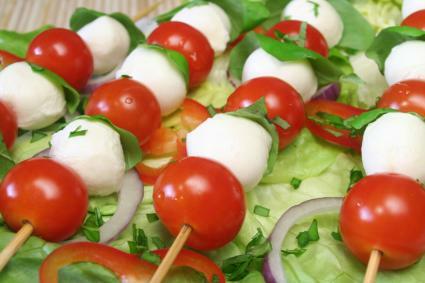 Place mozzarella balls, tomatoes, and basil leaves on a skewer in an alternating pattern. It's always a good idea to include some low-calorie finger foods, such as quinoa balls and split pea cabbage rolls, in your party menu for your more health-conscious guests. Serve this savory appetizer with fun-shaped, whole-grain chips. Spice up your party with this flavorful snack. Put out small cups of nuts or serve it in bowls for grazing guests. Choosing meals and sides for your vegetarian party menu is easy when you use the following delicious recipes and products. Try this unique, creative and fun vegetarian recipe for your main dish. Cook the eggplant in a large skillet with olive oil over medium heat for 10 minutes. Cook the veggie burgers as directed on the package. 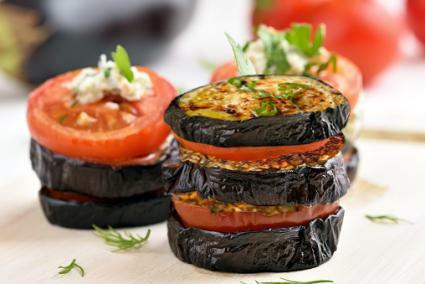 Place the veggie burger and tomato between eggplant slices. Top with the basil leaves. 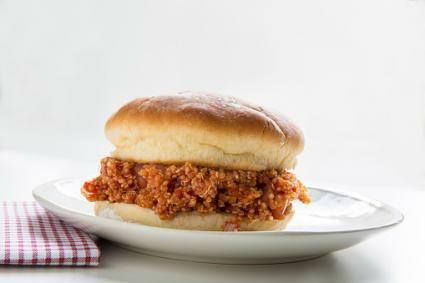 This recipe is sure to be a hit; it tastes just like regular sloppy joes, but without the meat. Heat up the ground soy protein in large skillet. Add the sloppy joe sauce and heat until steaming hot. Serve on hamburger buns with dill pickles and fresh vegetables. Tofu wraps work great as a main course but are microwavable so they are easy and quick to prepare. 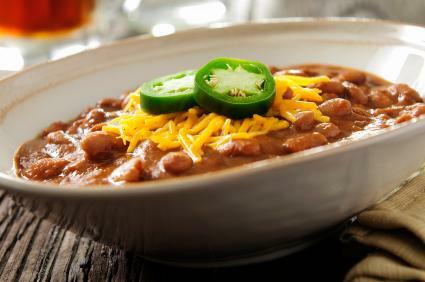 If your party is in the fall or winter, choose from a variety of vegetarian chili recipes as your main course. Top with Fritos to make Frito-chili pie. Spinach quiche is a common party finger food that you can make from scratch, or buy it packaged at any supermarket when you're short on time. Try a vegan spinach quiche recipe for your guests who avoid all animal foods. You can't go wrong when choosing quinoa salads as your vegetarian side dish. Serve in individual cups or potluck style. Simply heat up these packaged meatless meatballs, which you can buy at any large grocery chain or health food store, for a quick and easy main course or side dish. Add a toothpick and your favorite vegetarian sauce for dipping. Your guests will love flavorful Gardein barbecue wings (made with soy and wheat protein) that taste just like real chicken barbecue wings. You can purchase this product from large grocery chains. Simply heat up the meatless wings and serve. No party is complete without dessert. Fortunately, many desserts fit in with vegetarian party meal plans. When you're in a rush, choose a no-bake vegetarian cookie recipe for your party. Even your vegan guests can enjoy this chocolate-flavored sweet treat, served in individual cups. Make this delicious dessert using a box mix. You can find the mix at health food stores -- or order it online. This tasty treat is vegan and gluten-free, which will fit a variety of vegetarian partygoers' needs. 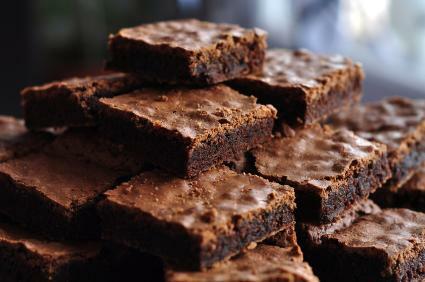 Top off your party fun with vegan dessert recipes that can tame any sweet tooth. A variety of unique vegetarian recipe options are available to choose from to make your meatless-themed party a hit -- even among non-vegetarians.